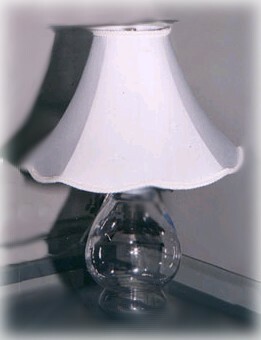 If you have a glass or ceramic vase that you no longer need, consider putting it to good use as a homemade vase lamp. As you’ll see, this project is quick and easy, so you can soon have a new home accent to brighten up your rooms. If you like this craft, you may also like to make a themed Canning Jar Lamp. Mason Jar Lamp Kit – these are available in craft stores, some hardware stores, and online from Amazon. There are usually two styles to choose from – one with the switch built into the socket, the other with the switch built into the wire. In a few minutes you can have this lamp complete. I saw lamps similar to this that were selling for hundreds of dollars – imagine that! This is very quick and easy and no drilling through glass is required. Simply attach the jar lid to the bottom of your vase, as shown in the photo at right. For this step, use Crafter’s Goop or any glue that is suitable for gluing metal and glass together and allow the glue to dry completely. If you want to add a finial/shade holder, you will need to do this before you glue your pieces together. Undo the nut that is on the underside of the lid and pull the socket section away from the lid. Attach your holder and replace the socket section, securing the bolt in place. That’s all there is to this lamp! You can use ceramic, porcelain, glass, clay or any other base of choice and any shade you like. By the way, the lamps that I saw didn’t have holes drilled either. The cord was left falling down the vase.